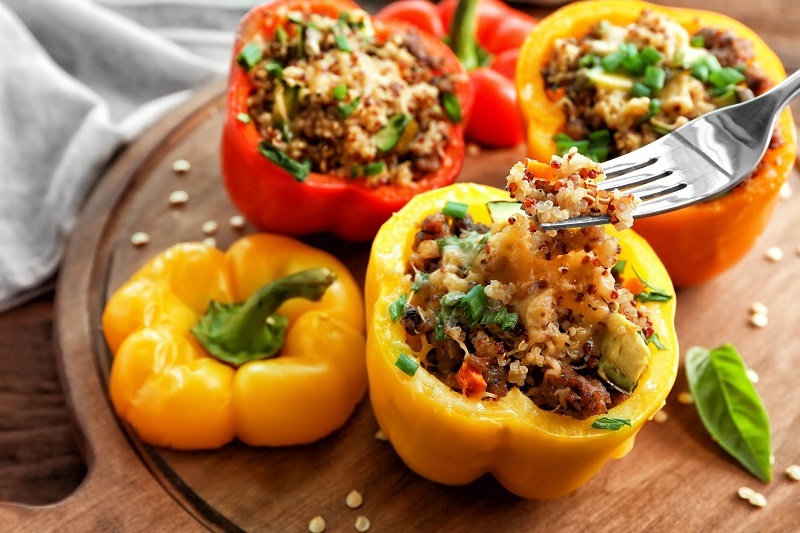 For a healthy meal the entire family will love, try this southwestern take on stuffed peppers recipe - perfect for a Meatless Monday recipe! 1. Preheat oven to 425°F. Grease an 8 x 8 inch baking dish. 2. Cook quinoa according to package directions. Set aside. 3. Heat oil in a large sauté pan over medium heat. Add onion and cook for 4-5 minutes until softened. Add garlic, black beans, corn and spinach and cook until spinach, lime zest and juice, salt, pepper, chili powder, paprika and cayenne pepper, and cook until spinach is wilted. 4. In a large bowl, combine quinoa, cooked vegetables and 1/4 cup cheddar cheese. 5. Fill peppers with quinoa mixture and place in prepared baking dish, standing up. Top peppers with remaining 1/4 cup cheese and cover with foil. 6. Bake 15 minutes, then remove foil and broil 1-2 minutes until cheese is melted.